The Mazda3 has been around since 2003, when the first-generation model replaced the long-serving 323 as the Japanese manufacturer’s C-segment contender. The first two generations were fine enough cars, as it were, but when the third-generation Mazda3 arrived in 2013, critics sat up and took notice. Built on Mazda’s own ‘SkyActiv’ platform, rather than a Ford chassis, the Mk3 was a handsome, well-equipped and sweet-to-drive hatchback that moved into the thick of the fight for honours in its class. 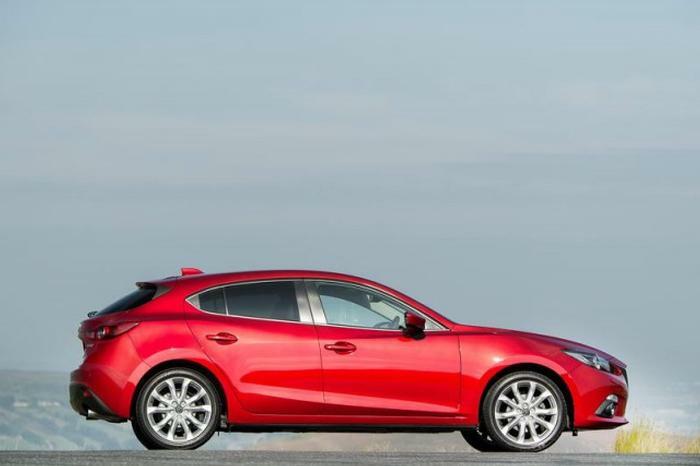 There are two body styles for the Mazda3, the regular five-door hatchback and the four-door ‘fastback’ saloon. Both were designed with Mazda’s ‘Kodo: Soul of Motion’ ethos and so are handsome machines, although we’d say it’s the hatchback that is the prettier car. Mazda offered its usual excellent range of SkyActiv-G normally aspirated petrol and SkyActiv-D turbodiesels in the 3, with capacities of 1.5 or 2.0 litres in the petrol range and 1.5 or 2.2 litres for the diesels. There was also a choice of six-speed manual or automatic transmissions, although the vast majority of Mazda3s sold in this country used the manual gearbox. The Mazda3 has one of the best cabins in any Japanese car going, a feature that was only improved by the late-2016 facelift, but – that said – parts of it are going to start looking and feeling their age now. Nevertheless, with acres of space on board and intelligently laid-out controls and functions, it’s a great interior. While there’s an anti-diesel sentiment in the air right now, Mazda staunchly refuses to turbocharge its SkyActiv-G petrol engines and so they’re hard work, as they are torque-light compared to modern forced induction motors. Thus, it’s to the diesel Mazda3s you must look: the 2.2 is by far the stronger performer, but there’s a train of thought that suggests that the 105hp/270Nm 1.5-litre SkyActiv-D is all the engine the Mazda3 needs. The third-generation Mazda3 was an excellent hatchback when it was launched and it remained an excellent hatchback as it went out of production early in 2019, ready for the all-new model to arrive. It has very few obvious weaknesses (if specified as a diesel model) and many things to recommend it, not least its sparkling driving manners, its unimpeachable reliability and also its attractive looks. It therefore makes an excellent used-car proposition for those looking for a first-class family vehicle.